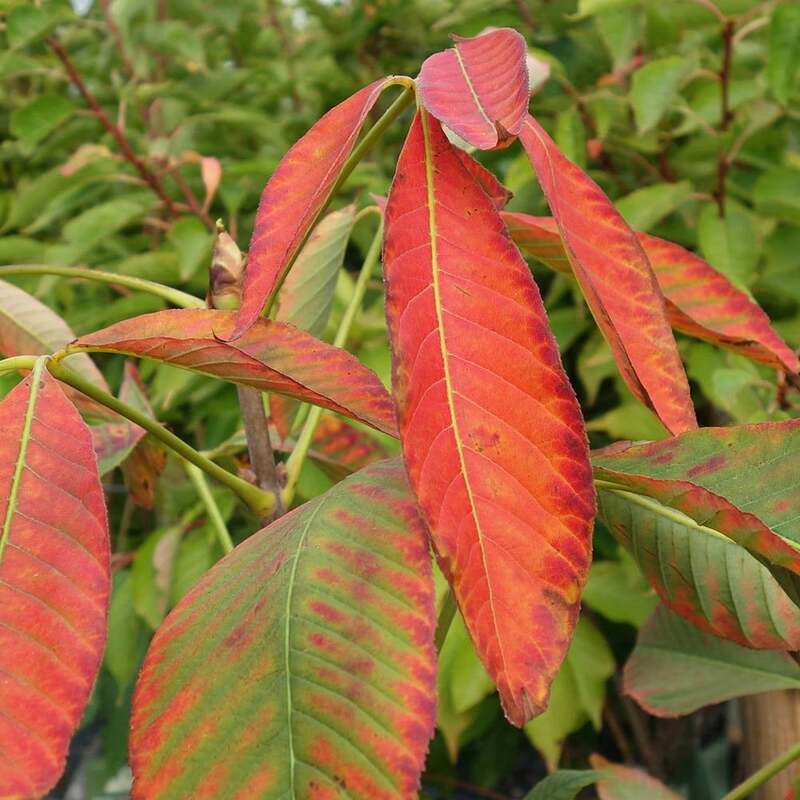 A delightful small tree, Aesculus x neglecta 'Autumn Fire' produces copper coloured young foliage which turns to dark-green in the summer before glowing shades of orange, yellow and red in the autumn. In May, creamy white panicles of flowers emerge and stand upright against the back drop of dark foliage. 'Autumn Fire', the Yellow Horse Chestnut, is the ideal specimen for spring and autumn interest in smaller spaces, as it will grow in a rounded form to approximately 4 x 3 metres in 20 years. This small ornamental tree will do well in most sunny positions and is fully hardy with some drought tolerance. Our pot grown Yellow Horse Chestnut trees can be planted at any time of the year. Begin by removing weeds and grass within a metre of your desired planting hole, then dig a square hole as deep as your root mass and approximately 2x as wide. To help your tree establish more effectively, sprinkle root grow into the hole. Gently loosen the roots and place into the planting hole. Mix 50% of the original soil with 50% high quality compost, fill in the hole and firm around gently, making sure not to bank the soil up around the collar of the tree. We recommend planting Horse Chestnut trees with a stake and tie. Place the stake at an angle to avoid penetrating the rootmass and knock it in until it is firm. If you’re planting Horse Chestnut in spring, summer or dry weather, water well and regularly for the first few months. Keep an eye on your young tree and increase watering if there are periods of hot or dry weather. If planting in autumn, you may only need to water a little. We stock irrigation kits to assist watering. Once planted, keep the area free of competing weeds and grass for the first couple of growing seasons. If your area is prone to rabbits, we advise using a rabbit guard. Horse Chestnut trees do not require regular pruning. If you wish to tidy up 'Autumn Fire', do this during the dormant season. Focus on removing any damaged, diseased or overcrowded branches. If you require a clear trunk, remove any side shoots to help raise the crown.